Each year on April 22, Earth Day marks the anniversary of the modern environmental movement born in 1970. Just a few years shy of its 50th anniversary, this Earth Day sees today’s outlook on environmental protection, awareness, and progress in a troubling state. The EPA is systematically being taken apart, with funding cut 31% and staff reduced by 20% in a new budget blueprint proposal submitted by the White House. Funding and research for other key environmental initiatives, like grants to states and the EPA’s air and water programs, would also be slashed by a third. Thirty eight programs face not just reduction, but complete abandonment—climate change initiatives, grants to clean up industrial sites, and the brownfield projects, which would restore over 25,000 parcels of contaminated or polluted land containing hazardous materials across the U.S. We can’t stand for this. At Segment one of our four core values is Karma. Karma guides Segments to make good decisions by considering the impact of our business choices on our customers, our community, and even more broadly, the world. This Earth Day, we’re invoking Karma by organizing a joint effort with some of our partners to elevate environmental protection awareness and action. 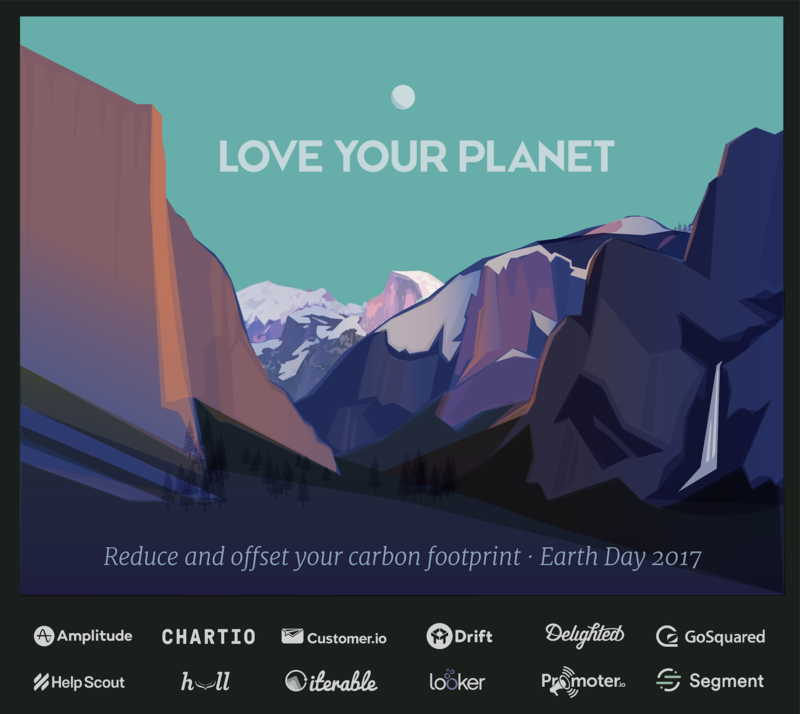 Together with Amplitude, Chartio, Customer.io, Delighted, Drift, GoSquared, Help Scout, Hull, Iterable, Looker, and Promoter.io, we’re proud to completely offset our collective carbon emissions for the entire year(*) with a $20,540.84 combined donation to carbon-offsetting initiatives including Carbonfund.org and others. We are all stewards of this planet. By reducing our carbon footprint where we can, and offsetting what we can’t, all twelve companies stand by a commitment to better the planet. This Earth day, we’re putting our values into action, standing for what’s right, and challenging the administration on its regressive plans for environmental protection in the US. Join in by calculating your carbon footprint for the year and donating to offset its effect, here. *Each company calculated its CO2 emissions and made a donation to fully offset the calculated carbon footprint. Offsetting costs were calculated using this simple tool. Some partners with international headquarters calculated and offset emissions from their US based operations.